Our essential Waitrose lamb is reared by specially selected farmers in either New Zealand or Wales, depending on the time of year, to high animal welfare and environmental standards. Mix the garlic and rosemary with 1 tsp olive oil and the lemon zest and juice. Pour onto the lamb and place in the fridge to marinate for at least 10 minutes, or up to an hour. Place the lamb on a baking tray and cook for about 15–20 minutes, depending on their thickness, turning halfway through, until cooked to your liking. Meanwhile, place the potatoes in a pan, cover with cold water and bring to the boil. 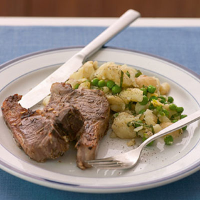 Cook for 10–12 minutes, until just tender, then add the peas and cook for 3–4 minutes until cooked. Drain and crush with the mint and the remaining oil. Season well and serve with the lamb chops.